CDL Skills Test: What will you be tested on? You may download a copy of the poster here. The CDL Skills Test consists of 3 parts: the Pre-Trip Inspection, Backing Maneuvers, and a Road (Driving) Test. During the Pre-Trip Inspection, students are required to inspect the Engine Compartment + 1 axle; the Side (and Back) of the Truck + 1 axle, Connections and Trailer + 1 axle; an External Light Check; and an In-Cab inspection with Brake Check. Connections Inspection TIP: Start at the back of the truck with the air/electrical lines. Then inspect the fifth wheel from top to bottom. Don't forget the kingpin and locking jaws! External Light Check Inspection TIP: Truck: front, left side, rear, right side. Trailer: front, left side, rear, right side. Truck, then trailer. 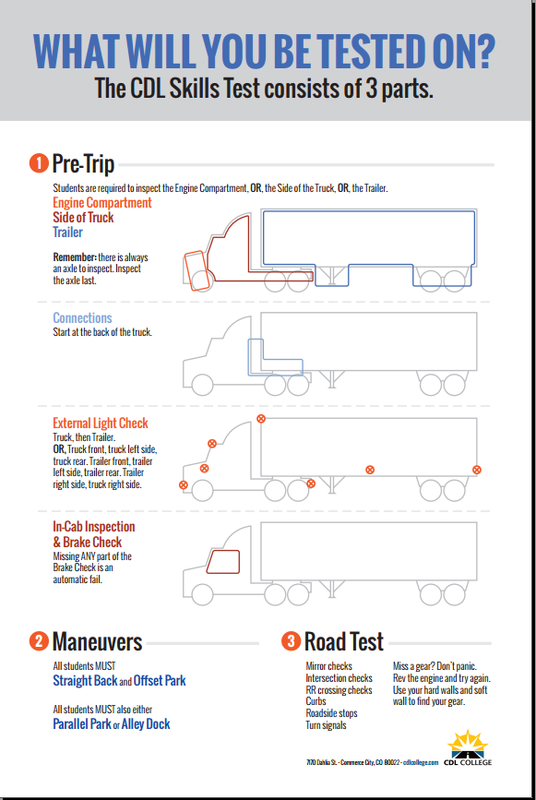 In-Cab Inspection TIP: Missing ANY part of the Brake Check is an automatic fail. Backing Maneuvers: All students MUST Straight Back and Offset Park. All Students MUST also/either Parallel Park or Alley Dock. Miss a gear? Don’t panic. Rev the engine and try again. Use the hard walls and soft wall to find your gear.